Bearing the stamp of a masterful storyteller who “observed the world with a clinically poetic eye,” Suzanne’s songs have always tended to focus on city life, ordinary people and real world subjects. Notably succinct and understated, often cerebral but also streetwise, her lyrics invite multiple interpretations. In short, Suzanne Vega’s work is immediately recognizable, as utterly distinct and thoughtful, and as creative and musical now, as it was when her voice was first heard on the radio over 20 years ago. Suzanne was born in Santa Monica, California, but grew up in New York City. She was influenced by her mother, a computer systems analyst and her stepfather, the Puerto Rican writer Egardo Vega Yunque. There was a heady mix of multicultural music playing at home: Motown, bossa nova, jazz and folk. At age 11 she picked up a guitar and as a teenager she started to write songs. In 1979, Suzanne attended a concert by Lou Reed and began to find her true artistic voice and distinctive vision for contemporary folk. Receptionist by day, Suzanne was hanging out at the Greenwich Village Songwriter’s Exchange by night. Soon she was playing iconic venues like The Bottom Line and Folk City. The word was out and audiences were catching on. At first, record companies saw little prospect of commercial success. Suzanne’s demo tape was rejected by every major record company—and twice by the very label that eventually signed her: A&M Records. Her self-titled debut album was finally released in 1985. The sceptical executives at A & M were expecting to sell 30,000 LP’s. 1,000,000 records later, it was clear that Suzanne’s voice was resonating around the world. ‘Marlene on the Wall’ was a surprise hit in the UK and Rolling Stone eventually included the record in their 100 Greatest Recordings of the 1980’s. 1987’s follow up, ‘Solitude Standing’ elevated her to star status. The album hit No.2 in the UK and No.11 in the States, was nominated for three Grammys including Record of the Year and went platinum. It included ‘Luka’ is a song that has since entered the cultural vernacular; certainly the only hit song ever written from the perspective of an abused boy. Suzanne’s neo-folk style ushered in a new female, acoustic, singer-songwriter movement that would include the likes of Tracy Chapman, KD Lang and Indigo Girls. Suzanne Vega is an artist that continues to surprise. Her song 'Tom’s Diner' was used in the refinement of the MP3, earning her the nickname 'The Mother of the MP3'. 'Tom’s Diner' has since been remixed nearly 25 times (by artists including Will Smith, Tupac and Destiny's Child). In 2006, she became the first major recording artist to perform live in avatar form within the virtual world Second Life. She has dedicated much of her time and energy to charitable causes, notably Amnesty International, Casa Alianza, and the Save Darfur Coalition. 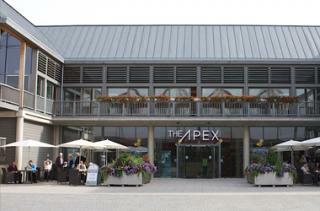 Suzanne Vega will be at The Apex in Bury St Edmunds on Thursday 28 June at 8pm. Tickets are £26 standing (all seats have sold out), ring the box office on 01284 758000 or see the website www.theapex.co.uk for more details, or to book. Barnardos works with more than 200,000 children, young people and their families every year. Accessorize is devoted to bringing the most exciting and eclectic fashion accessories to the high street.